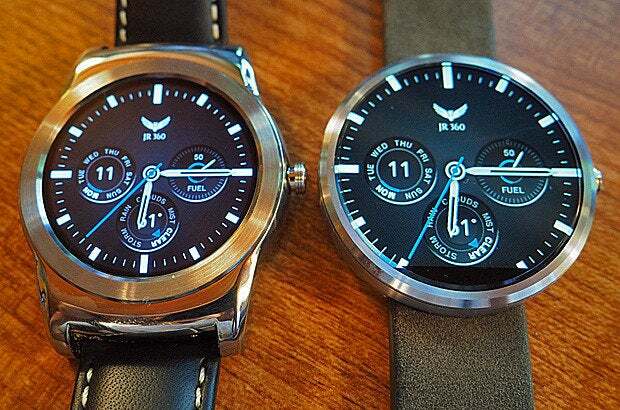 LG Watch Urbane or Moto 360 -- which Android Wear watch to get? An in-depth comparison based on extended real-life use. It's a tale of two smartwatches. 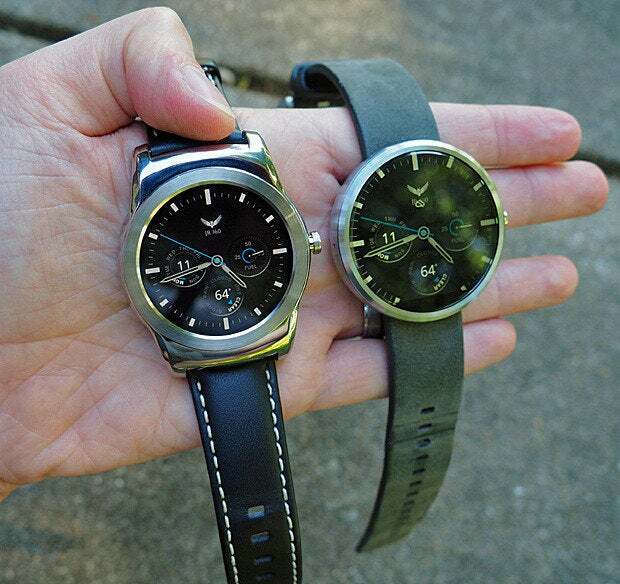 Both round, both running Android Wear. One selling for $349, the other for $180. So which watch is the one for you? We're talking, of course, about the LG Watch Urbane and the Moto 360 -- two of the most buzzed about Android Wear options in the current smartwatch landscape. The Urbane is the newest Wear contender, going on sale just days ago, while the 360 showed up last summer and was the platform's first high-profile smartwatch. I've been living with the Urbane for the past couple of weeks and wore the 360 almost every day for eight months before that. Here are some detailed thoughts about how the two watches compare in a real-world, day-to-day life sense. They may both be round, but when it comes to form and design, the Urbane and the 360 take decidedly different approaches. The LG Watch Urbane looks like a traditional timepiece -- so much that at a glance, most people probably won't realize it's anything more than a regular watch. Its face area is about the same size as the 360's, though its large lugs (the bridge-like areas on the top and bottom that connect the main watch to the straps on either side) make it feel a bit more bulky. It's slightly thicker than the 360, too, but the difference there is pretty subtle and noticeable only if you look closely at the watches side by side. The 360 doesn't even have lugs; it's literally just a disc with bands attached directly to it. Both devices are comfortable to wear, even with my writer-sized wrists (my new euphemism -- what do you think?). I'd probably give the slight edge in comfort to the 360, as its lug-free setup allows the watch to rest a little more naturally on my arm, but I've had no real qualms about the way the Urbane fits or feels. The Urbane comes with a stitched leather band that's reasonably attractive but nothing extraordinary; the 360 comes with a choice of different leather bands (some of which are nicer than others) or a variety of metal styles (all of which add 50 bucks to the watch's price). Both watches use standard 22mm bands, so you can swap them out for third-party alternatives if you want -- though the 360's unusual lug-free design makes the act of changing the band considerably more complex. It also limits the types of bands that work well with the watch; if you're planning to use a replacement that isn't sold directly or endorsed by Motorola, you'll definitely want to do a little Googling first to see if others have had luck getting that specific strap to fit properly. The winner: We'll call this one a tie. The differences in design are pretty subjective; some folks may prefer the Urbane's traditional and less conspicuous-looking approach while others may dig the 360's more distinctive and modern vibe. And as we'll see more in the next section, the 360's setup isn't without its drawbacks. This one's easy: The LG Watch Urbane's display is superior to the Moto 360's in almost every measure. And considering the screen is the primary thing you stare at when it comes to the watch's actual function, that's not insignificant. The main reason is that LG uses an atypical type of display called Plastic OLED, or P-OLED for short. As I noted in my hands-on impressions of the device, it feels like it was made specifically for smartwatch use. It's bright, clear, and easy to see in any sort of condition. The Urbane's screen stays on all the time, too, using Wear's ambient (or "always on") mode to show a pared-down version of the watch face whenever you aren't actively using it. Given the fact that this is, you know, a watch we're talking about, being able to glance at its face anytime to see pertinent info (the time, the date, the temperature, your fitness status -- whatever you want, depending on the watch face you choose) along with your most recent notification is invaluable. The Urbane's ambient mode looks great, too -- just as crisp and easy on the eyes as its fully illuminated setting. No other Wear device comes close to that level of ambient mode quality. The 360 is a particularly sharp contrast: Unlike most Wear watches, Motorola's offering doesn't even give you the option to have the screen stay on in a dimmed state when you aren't actively using it. It's my biggest frustration with the watch: The 360's ambient mode turns itself off whenever your arm is in a more vertical orientation or when you've gone a few minutes without touching it. That can get annoying, as you can't just casually look down to see the time if you're sitting or lying down; you have to awkwardly shift your arm around first to get the dimmed display to turn back on. And between the dimmed mode turning off and on and the fully illuminated mode coming off and on, you end up with a screen that sometimes seems to be in a perpetual state of change -- frequently lighting up and then darkening in one way or another even when you aren't intentionally interacting with it. That can get pretty distracting. Beyond that, the 360 has the now-infamous "flat tire" effect in which a small bar at the bottom of the screen is blacked out (since there's no real open space anywhere on the device, that's where Motorola stashed the circuitry to make the display work). It's easy enough to get used to and generally not that big of a deal, practically speaking -- especially if you find a watch face that's designed to work around the blacked-out bar -- but moving between that and the Urbane's fully round display, I'd be lying if I said I didn't notice and appreciate the difference. The same can be said for the light-refracting effect that happens along the 360's beveled edges, noticeable especially when there's a light-colored background on the screen. Again, it's not a huge deal or anything I tend to focus on much in regular use of the 360, but moving to the Urbane, it's definitely nice not to have it there. The 360 does have an advantage in one key area: Unlike the Urbane, its display has an ambient light sensor, which allows the screen to automatically adjust its brightness based on your environment. That's a meaningful feature for a watch in particular, as it keeps the screen from getting too dim in glary outdoor conditions or too bright in dark rooms. With the Urbane, you have to make those adjustments manually as needed (though I've typically just left the brightness at a middle-of-the-road setting and found that to be tolerable enough, if not always entirely ideal, in most situations). Within the same basic footprint, the 360's screen is also a bit bigger than the Urbane's -- a result of the bezel-free design. We're talking 1.56-in. of surface area vs. 1.3 in., so nothing enormous -- but once again, it's something that's noticeable when you look at the watches side by side or transition directly from using one to the other. The Watch Urbane and the Moto 360 are both more or less fine in the realm of performance, but the Watch Urbane is consistently smooth and snappy while the 360 gets a teensy bit jerky and laggy from time to time. It's far less of an issue than what was present on the 360 at its launch, prior to a major software update -- but when you use it alongside the Urbane, it's clear that it's a step behind. 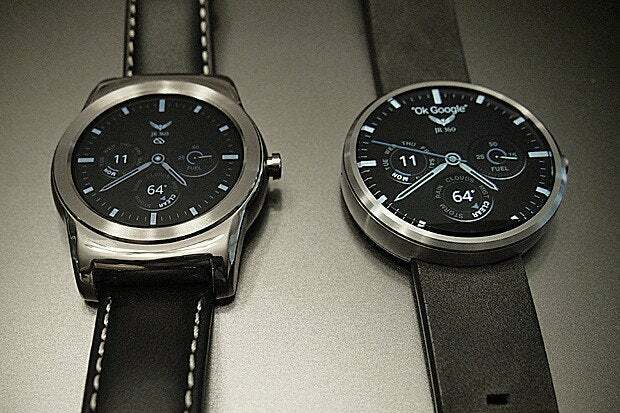 The winner: LG Watch Urbane. Not much deliberating needed in this department. Like most Android Wear watches, the Urbane and 360 will both get you from morning to night without any problem most of the time. With lighter use, you might be able to stretch either watch into a second day -- but realistically, you're probably going to want to drop either one on a charger when you go to bed each night. I'd give the slight advantage to the Urbane, as it seems to have slightly more staying power on average when it comes to heavy use in my experience -- but realistically, we're looking at a day's worth of use for either device in most scenarios, so the difference isn't terribly significant. The winner: Tie, with a slight advantage to the Urbane. A day's use is a day's use, so for most people, this won't be a deciding factor. The 360, on the other hand, utilizes standard Qi wireless charging. It comes with a nice cradle that holds the watch in an upright position while it charges, which makes it perfect to use as a nightstand clock (especially with Motorola's ambient light-sensing display, which makes sure the screen doesn't get too bright at night). And while you can pick up an extra official cradle for 40 bucks, the best part of the 360's setup is that you can just as easily drop the watch on any Qi-compatible pad -- including a portable Qi-enabled battery pack -- and juice it up anytime, anywhere. That's a powerful perk (get it?! ), especially if you travel much or ever have a need for charging in multiple places. The winner: Moto 360. All smartwatches should work like this. Android Wear is fairly standard across devices, so there's not a heck of a lot of difference on this front -- or, at least, there soon won't be. The Urbane is the first watch to ship with the new 5.1-level version of Android Wear, which includes an improved navigational system and the very cool ability to use your watch over Wi-Fi even when your phone isn't nearby. That update is coming to the 360 soon, though -- within the next couple of weeks, according to Google -- so it's basically a moot point. LG and Moto do each offer some custom software add-ons along with the regular Wear OS. LG's isn't terribly meaningful: It's an app called LG Call that lets you view your recent calls and favorite contacts and then initiate a new call on your phone by tapping one of them or using a built-in dialpad. The latest version of Wear provides most of that same functionality natively, though, so you don't gain much from LG's addition. Moto's add-on, on the other hand, is a bit more useful: The company's Motorola Connect app runs on your Android phone and allows you to see your watch's current location on a map, in case you ever can't find it. It also gives you the ability to customize the various faces that come preloaded on the device. The winner: Tie, with slight advantage to Moto 360. The differences in this domain aren't enormously important, but Motorola's approach provides a nice little bonus that can certainly come in handy. After living with both devices, I'd say this: I love the Moto 360's design, and I've genuinely enjoyed wearing it and using it over the past several months. But between the Urbane's superior display that stays on all the time and its more consistent performance, LG's watch really does feel like a substantial step up in overall user experience. And given how long after the 360 it debuted, that probably shouldn't come as a huge surprise. That's not to say the 360 is without its merits. Its design alone may be enough to make it worth purchasing for some people; this is essentially a piece of jewelry, after all, and appearances count for a lot. The 360's ambient light-sensing ability and standard Qi wireless charging are very compelling features, too, and let's not forget that it's now almost half the price of the Urbane (likely since we're inching closer to the watch's one-year anniversary and thus its inevitable second-gen replacement). Like most mobile tech decisions, it all comes down to what style you prefer, what factors matter the most to you, and how much you're looking to spend. If you can live with the okay-but-not-quite-stellar performance and the less impressive screen that doesn't stay on all the time -- and you don't mind the quirks like the "flat tire" and light-refracting effects -- the 360 is an excellent value and a watch you'll be happy to have on your wrist. When it comes to the basics, though -- the primary factors that are core to user experience -- LG's Watch Urbane has really raised the bar. Other smartwatches have their strengths and specific areas of appeal, but the Urbane provides a balance of form and function that's currently unmatched in the Android Wear ecosystem.